If I had purchased all of this at regular price, it would have cost me $45.70 (tax included). 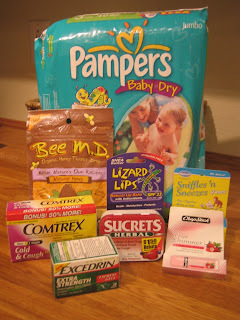 But, today all of these items were on sale, and I had a $1.50 coupon for the diapers. So, I ended up paying $32.36 out-of-pocket. However, all of these items have a Rite Aid Single Check Rebate so once I get the rebate check at the end of the month, I will have only paid $9.93! An added bonus...the Sucrets has an additional mail-in rebate for $1.50, so if I mail that in, the price drops to $8.84 (taking into account the $0.41 stamp)! Not a bad shopping trip! If you're interested in getting these deals at Rite Aid, you might want to hurry if you live in CA. At some stores in CA, Rite Aid deals run from Thursday to Wednesday, so you've got to get them today and tomorrow. If you've never done Rite Aid's Single Check Rebates, I highly recommend it! All you need to do is sign-up for an account online, enter some info from your receipts throughout the month and request the check at the end of the month. No forms to fill out and mail. I usually get my check within a couple of weeks. Whoo hoo! You go, girl! Thanks for the heads' up.